I was doing so well in London last weekend, released some books, picked up a few books from the OBCZ. And then on Sunday, I made the fatal error of going into the new Waterstones on Oxford Street. The 3 for 2 table drew me over, and this was one of the choices! A completely fanatastic, thought provoking book about the film "Super Size Me" Spurlock has a similar writing and journalist reportage style to Michael Moore, and his book is well researched with plenty of appendixes and calls for further action. 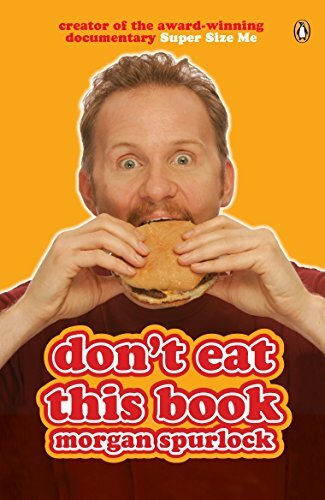 I would have liked more details about his experiences during his month of eating only MacDonalds, but in fact a lot of his book was a discussion and exploration of MacDonalds, american eating and exercise habits, and the steady march of Americanization across the world (although he does include plenty of examples from other countries including the UK!). What I liked about this book was its emphasis on the central role that food and eating plays in our lives, and the ways in which food is culturally understood. He spends a long time talking about family eating patterns, and the important role that Parents play in their children's learnt eating habits. He includes lots of little anecdotes from his family life, and discusses his eating habits as an adult. Another main theme is that of legislation verus litigation, and he thinks that in the future fast food companies will be sued big scale, in the same way that tobacco has been. Spurlock does not underplay the element of personal responsbility in our choice of food and lifestyle, but he strongly argues that the fast food companies are not honest or transaprent in their information about the production and chemical content of their food. Favourite quote? (This made me laugh in bed last night, and had to read aloud to hubbie!) Morgan describes here some of his 'diet's' side effects. An extremely interesting read, and it will make you reassess your own food and eating patterns. Read alongside "Fast Food Nation" and check out the Super Size Me Website. a good re-read at the end of 2009! Passed on to friends at my book party in 2010!